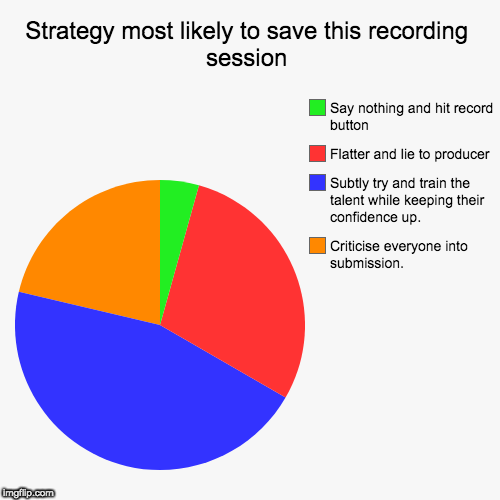 I have worked with producers who were so critical of their talent that they managed to reduce the performer to a nervous wreck, thus ruining their own session. Some even drive their talent so hard and for so long that the talent’s voice becomes fatigued and they become physically unable to work. Oh and one more thing. Next time I am going to tell you about my secret vst plugin that makes EVERYTHING, and I mean EVERYTHING sound better. I mean you don’t even need to know what your doing and it works like magic. This secret weapon will make your mixes sound killer and fresh and phat, so fresh you won’t even be able to eat or move ever again after you hear your track with this secret vst plugin on it. Yeah so stay tuned.